Our Managed Print Services Programs use a process that streamlines the most valuable cost-saving capabilities. The first step is the document assessment. Our experts first analyze your current print fleet and potential cost savings. Then recommend the best deployment of your current equipment as well as the most appropriate Managed Print Service tools for your situation. Real-Time Reporting: Monitoring software that gives you real time insight into the status of your printer fleet. We also leverage this information to take care of service and supply needs proactively. Pro-Active Supply Restocking: Proactive supply restocking. Handles all supply management and reordering hassles. When a printer cartridge reaches pre-set thresholds, we automatically ship a new cartridge directly to the unit. Print Cartridges: Take advantage of quality printer cartridges for every major brand of printer. You can choose from OEM cartridges or quality compatible cartridges. Ongoing Optimization & Analysis: We work with you on a regular basis. Review over your changing business needs and your usage trends. From this, we can collaborate to continually optimize your printing infrastructure. Nationwide Service: Certified nationwide to provide on-site support for every major print brand. Help Desk Support: Each device will have our 800 support number. We will work to resolve the issue immediately, over the phone, and we will send a technician on site when needed. Printers/Multifunction Systems: We can work with what you already have. Our Managed Print Services programs do not require capital expenditures on equipment. In some cases, we may recommend additional equipment. 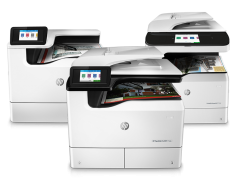 You can choose from a portfolio of new and re-manufactured printers and multi-function systems. These can even be bundled in your cost per page billing. At Star Managed Services, we specialize in helping manage your printing needs. Contact us today to learn more and to get started immediately! Learn how you can optimize your office with Stargel Office Solutions.